There aren’t many sayings that evoke instant cultural heritage more than a ‘proper English garden’.The concept of an English landscape garden is something many people consider an essential part of their home. And more importantly – it can add value to your home. If you have a garden that could do with an upgrade, there are some affordable, quick fixes to help improve your pride and joy. For many people, a home isn’t complete without a garden to exercise their green fingers and landscaping techniques. Luckily for people in Dorset, it’s one feature that most properties have as standard. Dorset is a very green country, with a lot of open fields, rolling hills, and low levels of pollution. 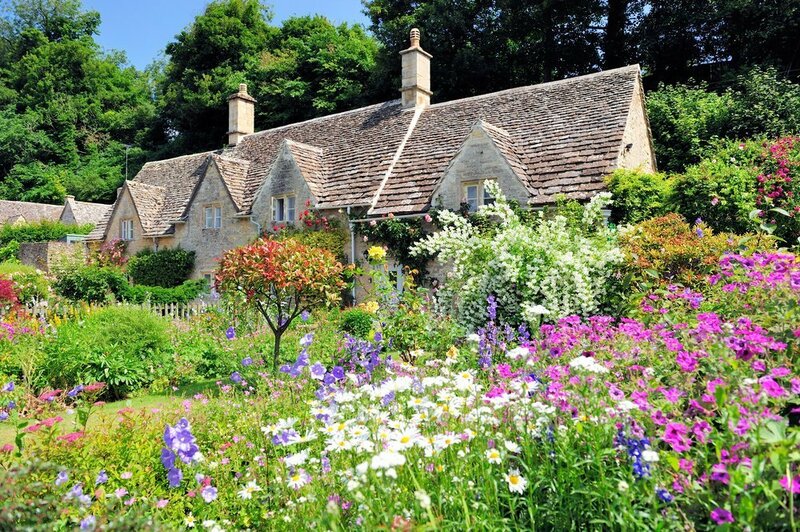 So, if gardening is your thing – Dorset could be the place for you. The first thing you’ll need to decide on is what your goal is for your garden. If it’s just a quick fix to make it presentable, possibly for a gathering, then there are some immediate tasks you can do. If, however, you’re looking to do an overhaul of your entire garden, you should consult a landscape gardener. For this blog article, we’ll be concentrating and some instant gardening gratification. Now, let’s grab our gardening tools and willingly dive into the task or tasks at hand. It’s time to get rid of any weeds and dead plants. Maybe sure you unroot everything, or the weeds will return. If you have pot plants, give each pot a thorough clean before repotting the plants. Then, you can scrape the top layer of soil away, remove any moss or weeds, and replace with a fresh layer of compost or mulch. You may need to invest in new pots if cracks are too prominent. If you have paving slabs that need to repair, try and flip them over if the cracks are superficial. You should also take this time to correctly fix them, which will prevent any weeds from growing under them. For people who have decking, you should give everything a thorough clean and coat the wood to protect it. Not only will you be safeguarding the wood, but you’ll also instantly improve the overall look of your garden. You can also try adding new flowers or trees to your garden, in addition to removing any dead branches from existing trees. A technique that’s known as crown lifting will help improve how your current plants and trees look. And finally, make sure all the edges of your lawn have neat borders. You won’t be able to do much about balding patches on your lawn, but you can mark that down to reseed your garden. And finally – add some decorative items to your garden. Solar lighting is a cheap and effective way to create some sparkle as the night approaches. Although water features as less popular these days, a simple one that doesn’t sound like a miniature waterfall can still add a welcome ambience. A simple wood burner can help create some head as the night start getting colder. There are times where we need more space to realise the potential of our homes and gardens, which is where storage fits in. By using storage, you can keep all your gardening equipment and tools safe from theft or damage. Essentially, you’d be replacing the garden shed with something that would prevent the elements from damaging your metal equipment. And you could get rid of the shed to use the space for something more appealing. The great thing about having a storage unitis you can use it for multiple things. If you have an outdoor hobby like cricket or golf, you can store them with your gardening equipment. And if you have any items from inside the house, you’ll be creating a lot more space in your home and garden. Moreover, you’ll have the peace of mind that all your possessions are safe and secure. At Johnson’s of Shaftesbury, we have a number of keen gardeners and professional landscapers using our storage units. We offer excellent domestic and business storageoptions to suit everyone’s needs. There is no lease or minimum storage period to worry about, making it easy to store for as long as you need to. The Johnson’s of Shaftesburyteam serve the whole of Dorset and the surrounding areas. With over one hundred years of experience in removals and storage, our team has a rich history of providing the best customer service in Dorset. That’s why we have a loyal set of customers who always return to use us for all their removals and storage needs. Johnson’s offers a range of removalsand storage packages to suit everyone’s requirements. It’s a simple but effective ethos: more service options equal a better service for our customers. And for us, customer serviceis our number one priority. At Johnson’s, we always approach a job with a positive attitude and a drive to provide the best service possible. We believe that a company should put itself in their customer’s shoes to understand the different needs of each person. This not only helps us deliver the best possible service, but it helps us improve our removals and storage packages. We can use each job we do as experience for the next one. If you’re looking to improve your garden and create more space, contact ustoday. We have the right storage package to suit your needs in Dorset.